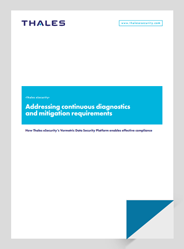 Addressing continuous diagnostics and mitigation requirements. Congress established the Continuous Diagnostics and Mitigation program (CDM) to provide a strong, consistent cyber defense designed to protect more than 70 civilian agency networks. With the Vormetric Data Security Platform, agencies can take a comprehensive, organization-wide approach to protecting data in support of CDM. Complete this form to download the white paper now.